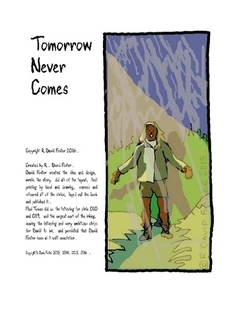 Tomorrow Never Comes: The book of all 100 strips is now available !!! 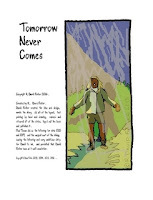 Just go to this printer link today to get your copy : http://www.lulu.com/shop/r-david-foster/tomorrow-never-comes/paperback/product-22948661.html . This book will be available for $25 from the creator(s) in person at the Toronto Comic Jam at the back of the Cameron House on Queen Street West in Toronto at their 20th anniversary jam on Tuesday, November 29th, 2016, after 8pm. Come meet Paul and I, David Foster !!! . . . . and stay for the Toronto Comic Jam's 20th ANNIVERSARY !!! Nevertheless, the strips will continue to be posted weekly on Sundays on this blog. The 100th strip should be posted in December 2017. This coming Sunday strip number 048 will be posted.